Every one need to improve their financial position. Money is not every thing but we need money for basic need, apart of this, we need money to fulfill dreams and goals for ourselves and for our family. Most of the time we are looking for alternative way to increase our financial position. Today we are exploring the small way to attract more money to fulfill wishes and goals. Vasudha is a symbol of Reiki energy, this symbol call every time for improvement for financial position. We can use this symbol in many formations, here I am explain in two format or this. 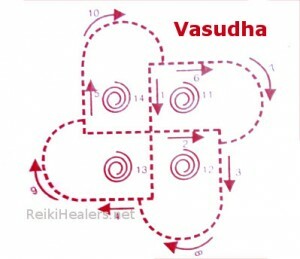 Very simple step to initiate / invoke it, burn incense sticks for purification, give the power symbol with it symbol 1+Vasudha+1 or send the higher energy. Place this symbol at your workplace. You can also use this symbol in home to make a miracle box. 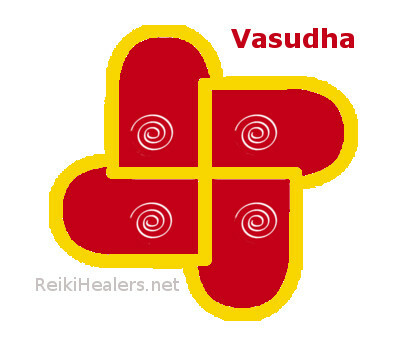 It’s very simple to make box, pick a small carton or any jewellery box and decorate it, place the Vasudha symbol in it with your intention back of the paper in this box, clean and charge this box every day and give the intention my financial situation is improving in every moment. Try this method and fulfill your dreams faster. Reiki start learning just for fun and learn something new, after doing my First and Second level of Reiki, I love to do Reiki. Start with learning new, or I would say magical, it is a science of nature. Curiosity to learn more give me the Grand Mastership in Reiki from Reiki Healing Foundation (RHF) Delhi. I love to do healing.